The first Faculty Forum of the year, six faculty members talk about, “Valuing the Liberal Arts & Sciences in the 21st Century,” in Shawnee Theatre, which more than 160 people attended. Sept, 10. Photo by Francisco Martinez. 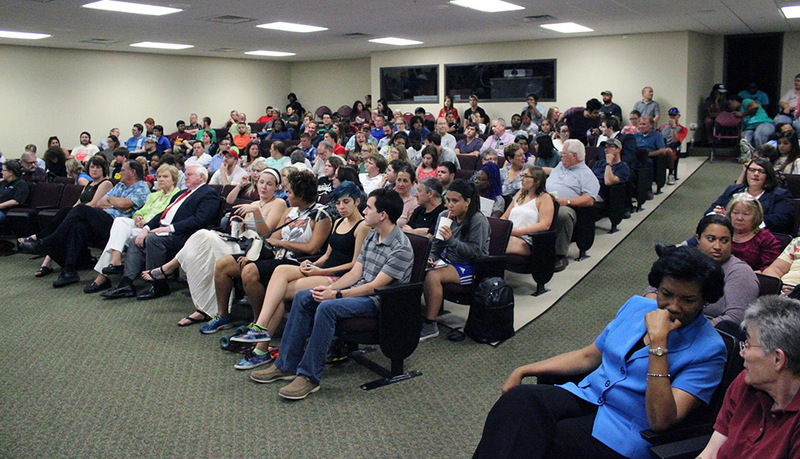 The first Faculty Forum event earlier this month at Shawnee Theatre greeted a full house. More than 200 students packed the theater to listen to a discussion by panelists from different colleges about the value of a liberal arts education. The major topics of the evening included defining the liberal arts, the importance of reading and writing skills, and how the colleges can work together to ensure all students receive a broad-based education. Todd Giles, assistant professor of English, moderated the event which included five faculty members: Matthew Capps, James Johnston, Nathan Jun, Ann Marie Leimer, and Charles Watson. Kirsten Lodge, associate professor of humanities, presented a brief historical timeline of the liberal arts. Giles said he wanted to create the panel to discuss with educators, administrators and students, MSU’s strategic plan and goals, as well as the benefits of a liberal arts education. The panel discussion highlighted these two goals, and the importance of promoting MSU’s mission and the value of the liberal arts in today’s smaller, globalized world. With people constantly bombarded about the importance of science, technology, engineering, mathematics, liberal arts colleges are having to explain the value of a broad-based education. Students are increasingly feeling the pressure to pursue degrees that tie in to current job trends. The panel’s aim was to educate people on the value of skills acquired in liberal arts colleges and universities. “The study of literature, film, history, and the sciences can be transformational” Giles said. By studying different cultural perspectives, students learn about the world and discover something about themselves, and teaches them to be more empathetic and sensitive, he added. Reading and writing skills were a major point of discussion as the panelists emphasized the importance of these courses within the core program. 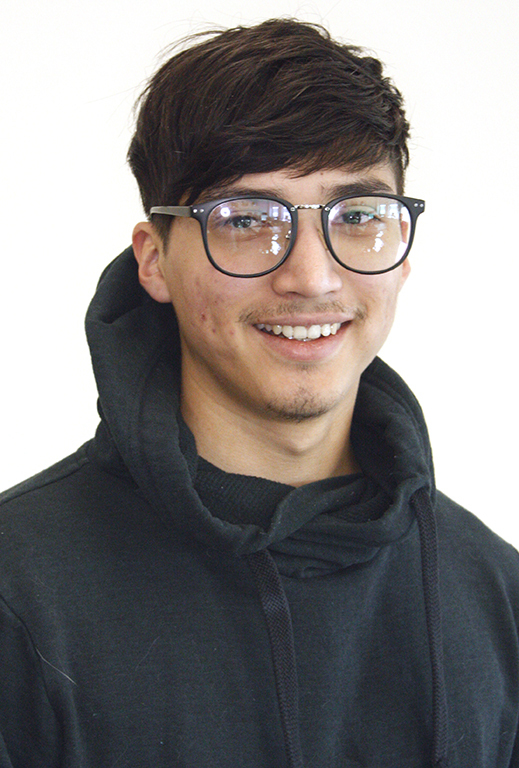 “The core has the ability to transform and help make a more well-rounded student,” said Jun. The western canon should be expanded to include a broader cultural perspective, he added. Critical thinking skills turned into a lengthy topic as the panelists spoke about how engaged students are when it comes to reading. “Students don’t like to read,” said Watson. “Writing is a way of thinking,” added Capps. Both men agreed that to be a good writer, a student must first be an avid reader. Reading and writing are skills that are interrelated. “The written word is a vehicle for how we think,” said Jun. “Reading is absolutely instrumental in a liberal arts education,” he added. David Rankin, English department chair, said he has never seen such a high number of attendance in the theater since he began working at MSU. “Being broadly educated means knowing about science, literature and the arts, which all complement each other,” Rankin said. Hopefully this panel will become an MSU tradition, he added. The panelists spent most of the evening discussing the concept behind the liberal arts and what students can expect from a liberal arts education and its benefits, not only for a career path, but for every aspect of their lives. The panelists explained how a liberal arts education helped with their careers and personal lives. The common denominator among the panelists was that they took away the love of learning from their liberal arts experiences. The desire to pursue knowledge and explore different cultural perspectives helps a person look beyond his or her myopic view. During the discussion, Watson asked students in the audience how many of them knew what a liberal arts education means. Surprisingly, only a few students in the audience raised their hands. “The number is obviously in the minority,” said Watson. The panelists agreed they need to do a better job in promoting the benefits of a liberal arts degree and how it complements professional training. “I’m thrilled with the turn out and faculty and audience engagement during our public discussion about the value of a liberal arts and sciences education on so many levels,” Giles said. The interest among students, faculty and visitors gave off a kind of palpable energy in the room as most students watched attentively, while many took notes. Giles said one of the main points that stood out for him was the fact that many faculty members understood the importance of the liberal arts mission, and are committed to moving MSU forward by engaging in innovative approaches to interdisciplinary student-centered learning. “There was a tangible energy in the room coming not only from the faculty panelists but also the audience, including the students, some of whom asked very challenging and provocative questions,” said Giles. Giles said he plans to keep the discussion going on campus about the value of a liberal arts education, and hopes that students and educators will do the same. “One thing I am doing on an individual level is discussing some of the issues addressed in the forum with my classes. On top of this, I believe we need to get together both formally and informally as an institution to further discuss the ideas addressed during the panel discussion–mission, branding, marketing, assigning critical reading and writing assignments in all classes, codifying interdisciplinary teaching practices across the disciplines. What the event made very clear to all of us is that there is indeed a desire across campus to further embrace our COPLAC mission to help students in every discipline become more well-rounded critical thinkers,” Giles said. Laura Estrada, senior in English, said faculty and students should indeed promote the value of the liberal arts degree because it provides a more well-rounded education than those seeking professional degrees. “Liberal arts opens up a whole new and vast world to students,” said Estrada. Toward the end of the evening, Watson urged students in the audience to talk with friends and family members about the value of the liberal arts and advantages of a broad-based education. “We need more student ambassadors to spread the word about liberal arts in today’s world,” Watson said. Giles teaches American literature, ecocriticism, Zen philosophy, and critical theory in the Department of English, Humanities and Philosophy. He is one of the founding advisors for the Arts & Literature Society and sits on the boards of the Wichita Falls Museum of Art at MSU and the Wichita Falls Symphony Orchestra.